장군은 물·술·간장·오줌 따위를 담는 그릇의 하나로, 크기가 작은 것은 물이나 술 따위를 넣고 큰 것에는 오줌을 담아 지게로 운반할 때 사용하였다. 길이 34.5㎝, 측면 지름 15.4㎝, 아가리 지름 5.3㎝로 비교적 큰 크기의 장군이다. 긴 타원형 몸통에 한쪽 면은 둥글고, 다른 면은 편평하다. 몸통 윗면 중앙에 작은 아가리를 달았는데 손상이 많다. 전면에 두터운 백토 칠을 고르게 한 뒤, 음각으로 선무늬를 나타내는 조화기법과 무늬의 배경을 긁어내 무늬만을 남게 하는 박지기법으로 장식하였다. 아가리 주위에는 좌우 사각형 안에 큼직한 꽃잎무늬를 한 개씩 넣었다. 둥근 측면에는 원안에 꽃잎무늬를 배치하고, 그 둘레에 연꽃잎 무늬를 돌렸다. 편평한 측면에는 나뭇잎무늬를 돌리고 있다. 몸통 가운데에는 모란잎과 모란꽃으로 장식하고, 바닥면에는 두 줄의 물결무늬를 새겼다. 모란잎무늬가 있는 면의 유약은 고르게 잘 녹아 있으나, 반대편은 유약이 잘 녹지 않아 불투명하다. 당당한 모양에 어울리게 활달하게 베풀어진 조화·박지기법의 무늬가 일품인 장군으로, 조선 전기에 만들어진 것으로 추정된다. This type of barrel-shaped vessel was used as a container to hold water, wine, soy sauce, or urine. The small ones were for holding water and wine, whereas the bigger ones were used for holding urine and transporting it using an A-frame rack. This vessel is rather large, with length of 34.5 cm, lateral diameter of 15.4 cm, and mouth diameter of 5.3 cm. It has a long, oval-shaped body with one round side and one flat side. There is a small mouth in the middle of the upper body, but it is severely damaged. The entire surface is coated with a thick layer of white clay and decorated with incised lines and sgraffito design, which scrapes off the background and leaves the design untouched. A large flower leaf is placed in each square located on the left and right sides of the mouth. In addition, a flower leaf is placed inside a circle on the round side of the body, which is then rounded with lotus flower leaves. Meanwhile, the flat side is rounded with a foliage design. The center of the body is decorated with peony leaves and flowers, and the bottom is engraved with a pair of waves. Although the side with peony leaf design is evenly painted with well-melted glaze, the other side is less transparent because the glaze is not well- melted. 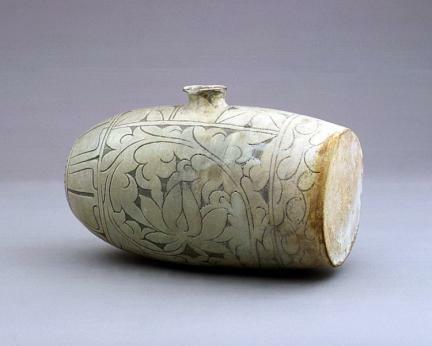 The vessel shown here displays excellent application of the incising and sgraffito technique reflected on its majestic shape. 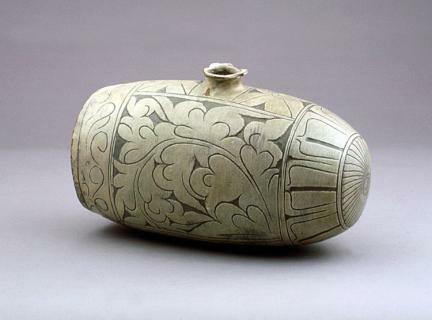 It is presumed to have been made during the early Joseon Period.